David Cobb (1921-2014). Oil on board, signed David Cobb and dated "87". Dawn steels over the sky as HM MGBs 83 and 81 return to harbour, another dangerous night's work over. This painting by Cobb, himself a post WW2 Costal Forces officer, is superb, capturing as it does those special moments when the night's darkness gives way to the dawn, when ships' companies can relax a little after the dangers and tensions of the preceding few hours. 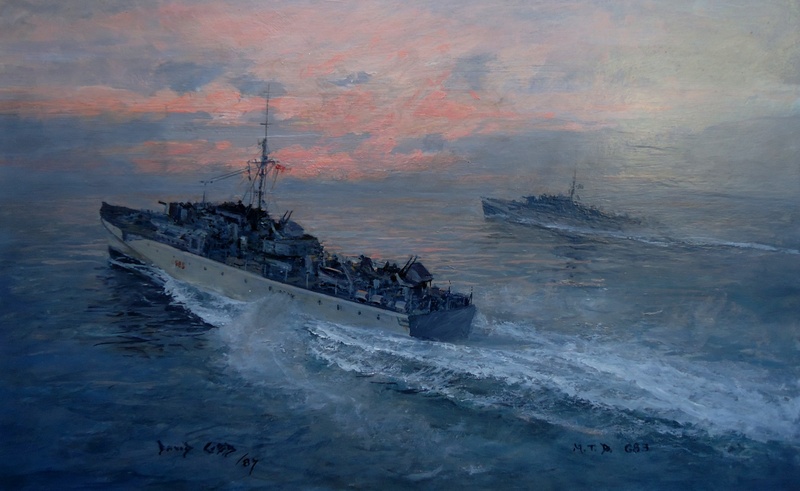 As with Cobb's painting of MTBs (also on this website), the scene could be straight from "We Fought them in Gunboats" written by one of the Masters of MGB warfare, Lt Cdr Robert Hitchens DSO* DSC** RNVR, who was killed in action leading his Motor Gunboat flotilla in April 1943.